Review: As much as I love listening to and reviewing anime soundtracks one after another, there are always those moments where I want to get away from it all and listen to something tangentially related to anime, but is different enough to be refreshing. That situation cropped up fairly recently for me and when I saw that seiyuu/anisong blogger j1m0ne released her debut album Limited Chords Works Vol. 1 seemingly out of the blue, I knew that this was the change I was looking for. After all, it’s pretty rare that I ever get a chance to listen to an anime doujin album to begin with; it’s even rarer that such an album originates from someone in the English-speaking blogging community. Alas, my eagerness was tempered somewhat when I actually read her post talking about this album since her commentary seemed closer to the sort of thing you’d see on a jar of rat poison. It seemed to shout out to me, “DO NOT LISTEN TO THIS ALBUM!!! IF YOU MUST, DO NOT CONSUME WITH FOODSTUFFS OR LISTEN TO IT WHEN WORKING WITH HEAVY MACHINERY!!! MUSICIAN IS NOT RESPONSIBLE FOR RUPTURED EARDRUMS!!! IN THE EVENT OF ACCIDENTAL USE, DUNK HEAD IN ICE-COLD WATER AND CONSULT YOUR PHYSICIAN OR PSYCHIATRIST!! !” Such a disclaimer seemed overblown, and I figured that since I had been listening to Aya Hirano a few days prior to this, I was fully inoculated from whatever j1m0ne could possibly throw at me. So with that, my journey began as I explored the album, filled with 33 anisong covers featuring j1m0ne and her guitar. 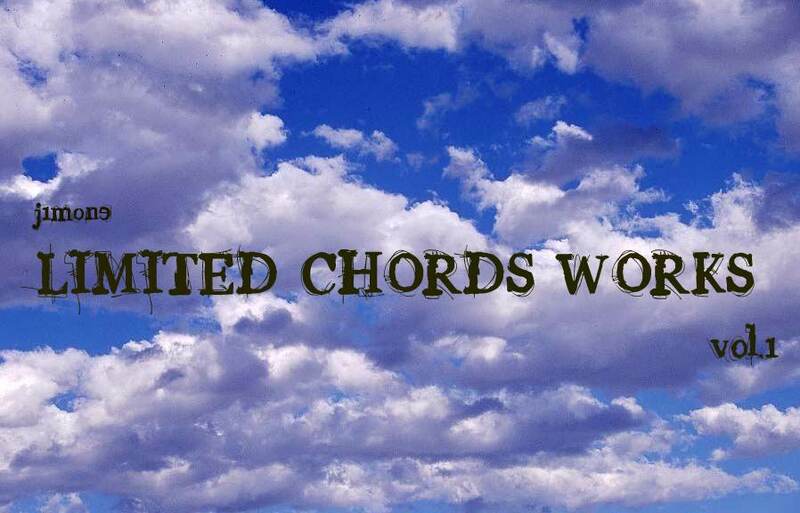 The first thing that struck me about it was the title of the album, Limited Chords Works, which serves as a preview for what is to come. I suspect the name is a tongue-in-cheek reference to the guitar part, which, when you listen to the arrangements, doesn’t deviate all too much from the base harmony that it provides for the vocal part. That is, there’s nothing wild or experimental about the guitar work and it serves its role as mellow background music well enough, even if it does pique my curiosity as to what an Unlimited Chords Works album would sound like. The other thing to notice are the track names which range from the hilarious “HERUPPPU MIII.” to the curious “D=.” Some track titles clues one in as to which track is being covered like with “Banana de Fly (Tokyo no Juice)” (it wasn’t that long ago that I praised this track from the Taisho Yakyuu Musume soundtrack) while others are jokes based on the song lyrics like in “Futari ni Got BREAD” (“God Knows” from Haruhi). Either way, scanning the track list provided good amusement value and the choices of songs to be covered that I could identify looked fairly promising. It was time to plunge into this album! The best way to describe the listening experience here is to compare it to a journey of discovery where you’re not looking for breathtaking sights so much as for the perverse delight to be had when you stumble upon j1m0ne’s rendition of a song that you recognize. It’s not that she’s a bad singer by any stretch since her mature voice earns a nod of approval from me given my disenchantment with artists who try to pass off high-pitched screeching as actual singing. Rather, it’s in the hilarity, especially when her performances of songs like “Ichigo 100%” contrasts so sharply with the original, in this case, Ichigo Mashimaro’s OP “Ichigo Complete.” Hearing a mature voice in place of the sugary original leads to a weird dissonance, but the results had me laughing and I was thoroughly delighted. Given her vocal range, it also makes me wonder how it’d go if she were to mirror the original as closely as possible, though I think this is one of those questions best left unanswered. Things get even better when you come across a familiar tune and then realize with a feeling of shock and horror just what song j1m0ne is covering. Such was the case with “Nomo no Ekiaki Uta” and what an experience that was. At the time, I didn’t have access to the romanized tracklist, and so, hadn’t readied my mental defenses for what was about to come and when the song started I was feeling quite content since it moved at a slow, relaxing pace with a warm, mellow voice that made for an enjoyable listen. It wasn’t until the words “Fine Purayy” came up that I realized where the song had originated. All I can say is that I’m thankful I heeded the warning not to listen to this while eating or my keyboard would be in a sorry state from the laughter borne from a mixture of delight at hearing the Nomo drawing song from Cross Game and horror along the lines of “ohmygodwhatisthisIdon’teven-.” Needless to say, it was great and I approve of this cover! So yes, like j1m0ne says on her site, there are times where her timing is just a bit off and she sings slightly out of tune, especially in the lower registers, but when dealing with fan-created works such as Limited Chords Works, I’m willing to give a bit more leeway, especially when it’s done in good fun. The most important requirement then is that a fan-made album be entertaining; I’m not concerned whether it’s done by impressing me with the quality of the arrangements or the artist’s amusing antics. Through this criterion, this album largely succeeds on the basis of keeping me delighted and amused even if it could have been made a bit better by being more cheesy and going all out. But boring it isn’t and if you’re looking for a change of pace, I’d definitely suggest giving Limited Chords Works a shot! Author’s Note: The album can be found in j1m0ne’s post here. The Surgeon General warns that those listening to this album may experience fits of nostalgia and delight, prompting those affected to declare it’s AWSM. Enjoy. And trust me, you do NOT want to hear me sing in a cutesy, high-pitched squeak. Honestly, it’s not bad. Much better than most self produced music out there. Like I mentioned, this album made for a nice change. Plus, it was fun as hell to write! Maybe one of these days, I’ll put out covers with me singing acapella or something and be subject to public scorn and shaming. nyoro~n. Just give it a listen. Even better because some of the pieces are recognizable. That’s where the novelty factor lies. Hell, it’s better than the fandubs I sometimes am forced to listen to on youtube.